The Rotary Club Foundation allocates $ 97,000 for a new Gelateria and pastry shop with a mobile laboratory. Training has been provided by Gino Fabbri, Carpigiani Gelato University and Fabbri 1905. 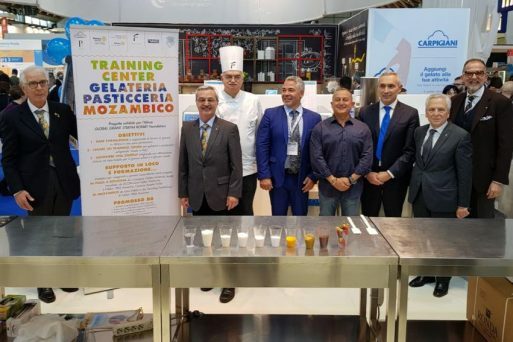 Rimini, 23 January – In the autumn of 2018, the small town of Ressano Garcia in Mozambique will see a gelato and pastry training center rising to give a chance to educate and provide opportunities to five young orphans of the Joao Batista Scalabrini Center as well as four young mothers of the local community. In addition, the result of these efforts will give life to a small local business that self produces its own products even equipped with a mobile gelateria. The project presented at Sigep 2018, inside the Carpigiani stand, was born thanks to the commitment of Rotary Club Bologna – Valle dell’Idice, District 2072 of Rotary International, Fondazione Bruto and Poerio Carpigiani, A.G.A.P.E. ONLUS, Fabbri 1905 and pastry master Gino Fabbri, trainer of the World Cup of Pastry. The initiative falls under the name of “Rotary Solidarity Project for Africa No. 1758744” and will support the Joao Batista Scalabrini Center in Ressano Garcia with a contribution of 100,000 dollars for the training course and the implementation of the laboratory production and start-up of mobile gelato parlors. April 20, 2018 | Filed under Uncategorized @en.